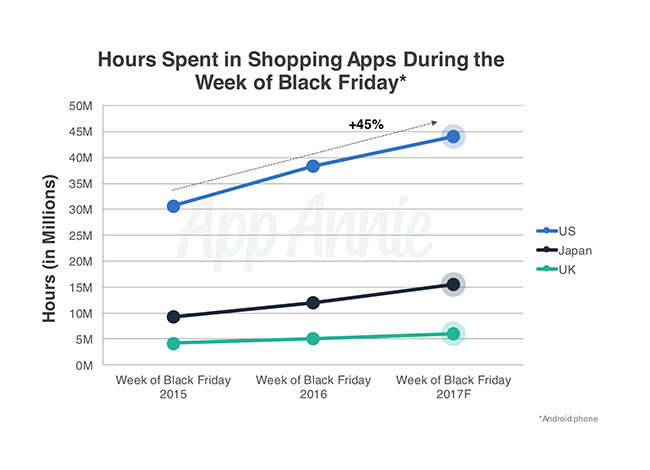 A new report from App Annie predicts that time spent doing mobile shopping via apps will grow 45 percent in the U.S. during the week of Black Friday, compared to the same time two years ago. The firm also expects revenue generated through apps to break new records this season, and says consumers will spend over 6 million hours shopping in the top 5 digital-first apps on Black Friday alone. App Annie’s forecast is based on data from Android devices in the U.S., as it doesn’t have visibility into iOS in the same way. The news follows an earlier forecast claiming mobile shopping visits will top the desktop for the first time this holiday season. According to App Annie, the 6 million-plus hours spent on Black Friday in the top five digital-first apps (e.g. apps from companies like Amazon, Wish, Etsy and Zulily that only exist online) represents a 40 percent increase over just last year. That also means that on Black Friday – November 24, 2017 – these top five apps will account for 15 percent of the total time spent in shopping apps during the entire Black Friday week (Nov. 19-25). Meanwhile, other top shopping apps that App Annie dubs the “bricks-and-clicks” apps – meaning those where the retailer has both an online and brick-and-mortar presence – will also see some growth, though not as strong. Top bricks-and-clicks apps include those from retailers, like Target, Walmart, The Home Depot, and Kohl’s, for example. The firm predicts the top five apps in this group will see 30 percent growth in time spent on Black Friday 2017, compared to Black Friday 2016. Combined with the expected increases in mobile shopping revenues generated in the apps, App Annie believes Black Friday 2017 will be the biggest mobile shopping day ever in the U.S.
Black Friday may also lead to a ripple effect in mobile e-commerce around the world, the report points out. As with the traffic increases seen on Amazon’s Prime Day, the total time spent in shopping apps outside the U.S will also increase this year. In Japan, the time spent in shopping apps on Android will be up 65 percent from 2 years ago to over 15 million hours; the U.K. will see a 45 percent increase to over 6 million hours. This year, AliExpress may also see significant usage during Black Friday week. The app already snagged the number one spot for shopping apps across iOS and Google Play ahead of Singles’ Day (Nov. 11) in the U.K., France, and Germany. App Annie had previously reported the growth in mobile shopping in general here in the U.S., noting that consumers were now spending 10 hours a year in these apps.